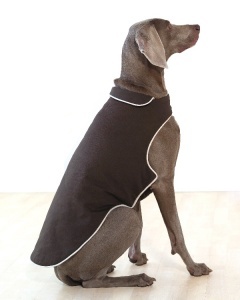 100% quilted cotton canvas outer shell with a wonderful soft feel corduroy collar and trim fleece lining on the inside, and warm insulating material to help keep your dog warm and dry. Protective finish remains functional even after 50 wash cycles. Requires less washing and dries much faster than other dog apparel. Adjustable neck and belly closures assure just the right fit.